After the shocking victory of Donald Trump in November 2016, three friends came together to eat lunch and console one another. 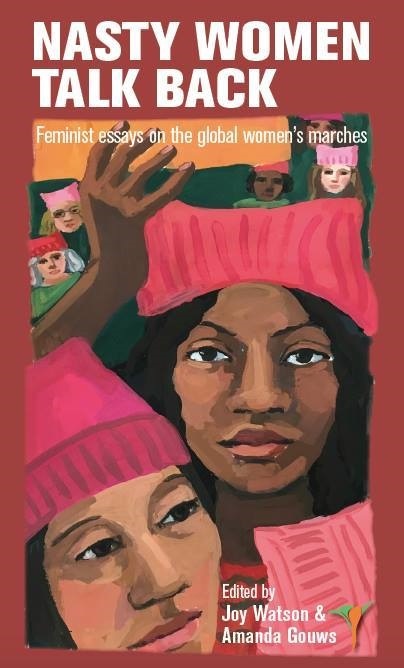 Two of them, Stellenbosch University Professor of Political Science Amanda Gouws and feminist researcher Joy Watson, decided to put their anger into action and the collection of feminist essays, Nasty Women Talk Back: Feminist Essays on the Global Women's Marches was born. Reading through the wonderful contributions included in this fascinating volume, I was struck by three things: First, I am astounded just how much Donald Trump has managed to change the world since his unfortunate, and perhaps illegal, rise to power. I saw this in the fierce fight I had with a family member who thinks Trump is the best president ever! I heard it in the anecdote a colleague told on return from a visit to friends in Alabama for thanksgiving when she overheard a mother snapping at her college daughter at the conveyer belt at the airport. The daughter seemed to have just returned from an obviously more progressive school, perhaps in the north east: "Could we just not start talking about Donald Trump?" the mother quipped. And I read it in the essays in Nasty Women Talk Back that, in some sense, can be described as an anthology of pain: a document of some of the contributors' own painful experiences in the past triggered by Trump's disgusting comments, but also behaviour. It is also a document of the many black, brown, gay, transgendered, female and immigrant others who have been deeply hurt, and are less secure and less safe that before November 8, 2016. Second, I am also struck by the fact that probably the greatest accomplishment of Trump is the way in which he has emboldened so many little donald trumps in our lives. How many of us all over the world see how these little donald trumps have become ruder, cruder, crueller? Political correctness is dead. There is a new lease on life for those little donald trumps to make America great again, or, one could say, "white, heteronormative and male" again. We see this in the rise of racist, neo-Nazi, anti-immigrant, nationalist elements all over the world – and in our midst. We see it in the death of civility, respect, kindness and truth. How will we ever be able to have arguments again without being bombarded with the conversation-ending exclamation: "CNN. New York Times. Fake News?" Perhaps because things feel so dark with no light yet on the horizon, I was in the third instance struck by, and greatly heartened by the many stories of Nasty Women Talk Back. Employing humour, wit, thoughtful reflection and the very best of their critical abilities, these women individually as well as collectively in acts of micro-bravery rise up and say: "No!" No to Donald Trump. No to every man who think he is or wants to be Donald Trump. "No. I don't think so. I prefer not to. No." I am a biblical scholar, so I often find myself entering the narrative world created by ancient biblical texts that sometimes speak in remarkably new ways. I was thinking of the story of the prophet Elijah that is hidden somewhere in the book of Kings. After an epic battle with the Baal prophets with fire coming down from heaven that settled the "whose God is the greatest" contest, Elijah finds himself under a broom tree, utterly depressed, burned out, having had to flee from those who want to kill him and feeling all alone in the battles he is fighting. What is interesting about this account though is that what ultimately helps Elijah to feel better is not just the theophany in which he quite dramatically experiences God's presence. Or the angel that comes to offer him food and water to sustain his weary body and even wearier soul. Ultimately, what is responsible for him continuing on his way is the reference that he is not alone but that there are also 7 000 others who he did not even know were fighting the same battle. Perhaps this is what I felt while reading through this collection of essays. I, and those of us who are bravely marching on, are not alone. - Prof Juliana Claassens is head of the Departement of Old and New Testament and Gender Unit in the Faculty of Theology at Stellenbosch University.